Tokyo, 15th March 2005 --- Hitachi, Ltd. (NYSE:HIT / TSE: 6501) today announced that it has developed a robot-called "EMIEW"*-for supporting people's everyday lives. EMIEW has the physical capabilities, such as agile movement and obstacle avoidance, needed for real life, and can move about while interacting in dialog with humans from a distance of one meter without the need for microphones. The technologies developed for EMIEW will lead the way in creating robots of the future that can cooperate and coexist with humans. As part of the "Project for the Practical Application of Next-generation Robots" commissioned by the independent administrative agency NEDO (New Energy and Industrial Technology Development Organization; Chairman, Tsutomu Makino), EMIEW will be on exhibit at the 2005 World Exposition, EXPO 2005-held in the Tobu Kyuryou region near Nagoya city in Aichi prefecture, Japan (namely, Nagakute town, Toyota city, and Seto city)- and at the Morizo and Kiccoro Exhibition Center from 9-19 June and at the "Nature Contact - Hitachi Group Pavilion" from mid-July until the middle of the summer holidays. As one of the Japan's pioneers of research on robots, Hitachi has pushed forward numerous technical developments up to the present time and, through these developments, has made considerable contributions to the advancement of society. Starting in 1970, Hitachi developed the first computer-control robot with artificial intelligence in Japan. Since then, the company has developed many epoch-making technologies and applied them effectively in a great many commercial products. EMIEW was developed as a robot for supporting people's day-today lives; namely, it brings comfort and convenience to everyday life while ensuring safety and peace of mind. 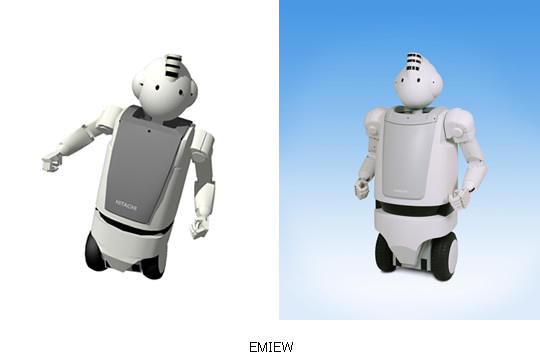 By utilizing Hitachi's considerable know-how in specialized technologies for autonomous movement and manipulation, EMIEW realizes three key features: "safety" by avoiding collisions with surrounding people and objects; "mobility" by adapting its movements to movements of people; and "coexistence and cooperation with people" through its friendly design. Moreover, the name "EMIEW" (Excellent Mobility and Interactive Existence as Workmate) refers to a robot that acts like a workmate through dialog interactions with people and its agile movements. From now onwards, Hitachi plans to upgrade the functions of EMIEW as a robot for coexistence and cooperation with people-for example, providing logistics support in offices and acting as a guide for customers at information desks-and continue to expand its practical applications. The main features of EMIEW are described in the following four sub-sections. EMIEW applies a self-balancing two-wheel-motion mechanism that enables it to move in compact spaces swiftly in the same environment as a person at a speed in tune with the motion of that person. By measuring gradients with mounted sensors while driving its two wheels, it can move about and stop in a stable manner. Since it can move at maximum speed corresponding to a fast walking pace (i.e., 6 km/h), it will not annoy people by being "slow." Furthermore, by shifting it center of gravity by swinging its body from left to right, EMIEW combines agile changes of direction-unlike conventional "humanoid robots"-with the physical capabilities necessary for real life. EMIEW is fitted with a "collision avoidance" function; that is, on detecting surrounding objects while in motion by means of mounted sensors, it confirms their location and movement, and then calculates the route it should take to avoid a collision with those objects. In contrast to technologies used in conventional types of "humanoid robots", this new technology gives robots the necessary functions for coexistence and cooperation with humans in real life. As part of a joint research project between Tsukuba University and Hitachi, Ltd., this technology utilizes the results of cooperative research performed by Associate Professor Takashi Tsubouchi and Vice-chancellor Shinichi Yuta and Hitachi's Mechanical Engineering Research Laboratory. Equipped with a vision sensor and multiple audio sensors, EMIEW can communicate in words over a distance of about one meter without need for any specialized devices. It analyzes the differences in sounds picked up by the various sensors in order to find the direction of the sound source. It then confirms the face of the person from whom the sound came by means of the vision sensor. In this way, it can even "hear" sounds and voices from separate locations. Moreover, by utilizing high-quality speech synthesis technology, EMIEW can respond in a natural-sounding voice. EMIEW has two arms, each with six degrees of freedom, that enable it to move naturally in almost the same way as a person, and its two hands enable it to grasp things and carry them about. Moreover, it measures movements of people by means of "motion capture" technology, and it utilizes this measurement data in accomplishing richly expressive "body communication" with people. Hitachi, Ltd. (TSE: 6501 / NYSE:HIT), headquartered in Tokyo, Japan, is a leading global electronics company, with approximately 326,000 employees worldwide. Fiscal 2003 (ended March 31, 2004) consolidated sales totaled 8,632.4 billion yen ($81.4 billion). The company offers a wide range of systems, products and services in market sectors, including information systems, electronic devices, power and industrial systems, consumer products, materials and financial services. For more information on Hitachi, please visit the company's Web site at http://www.hitachi.com.